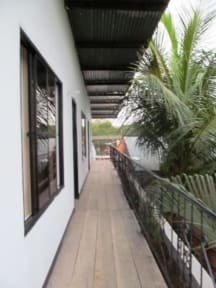 We are a family-run property in the cozy town of La Macarena, Colombia – the meeting place for adventurers who want to explore and enjoy the unique beauty of Caño Cristales and the Guayabero River. We offer accommodation that fits your need – standard private rooms or dormitories with comfy wooden beds dressed in soft linens. All rooms are spacious and airy, have their own bathroom with a shower and toilet, and are equipped with a TV set. Our hotel is the right choice for families, groups or backpackers. We just accept cash payment. The town of La Macarena has no ATM. 110% recomendable!! Las señoras del San Nicolas son tan amables y agradables que no se puede mejorar. Hacen su trabajo con tanto corazón y amor, no hay muchas personas de este calidad en el mundo. Muchísimas gracias por ser así! 110% worth it!! The ladies of the San Nicolas are so warmhearted and help you in everything you need, you can't make it better than that! They do their work with so much love. You don't find many persons in the world like that. Thank you so much for being like this!